Free to members, $5 at door for non-members. Still room for puppeteers to enjoy a performance/workshop by Mary Shaver! See Issun Boshi: the Tiny Samurai, then Mary will reveal her stage set up and take questions. After a short break, she will lead the hands on Hand Puppet Workshop…with handout! NOT TO BE MISSED! Tuesday Nov. 10 at 7:30pm. Thistle Theatre Studio, Magnuson Park. 6310 NW 74th St, Seattle, WA 98115. On bus lines and free parking. Puppeteer Mary Shaver will perform Issun Boshi: the Tiny Samurai, the Japanese tale of the small overcoming the large and being the hero. Following the performance, Mary will lead a hand puppet manipulation workshop, including a hand puppet manipulation hand out. By the end of this workshop we promise your puppetry skills will be improved! Mary Shaver is an artist, master puppeteer, and educator who spent twenty-five years living in Asia and Europe while traveling extensively worldwide. She performs, lectures, and consults; starred for three years on the award-winning children’s television show “Pepe’s Magic Tales”; has created for movies and major television networks. Honey Goodenough, of Puppet Slam fame and a 2015-2016 UNIMA board member, considers Mary Shaver an inspiration for her puppet career. The Fall Membership meeting for the Puppeteers of Puget Sound will be Thursday Sept. 17 from 7:30 to 9:00PM. Meeting will be at the Thistle Theatre Studio at Magnuson Park 6310 NE 74th St, Bld. 30, WA 98115. Agenda includes reports from attendees at the Puppeteers of America National Festival and the O’Neil National Puppet Conference. In addition there will be, photos, a short film, puppet entertainment and announcements for upcoming puppetry events in the region. A not to be missed event…please your friends interested in puppetry! Planning a PofPS meeting for an evening September 8-18 at the Thistle Theatre Studio at Magnuson Park. ACTION NEEDED FROM YOU: Participant please send Jean dates you CANNOT attend in the week of Sept. 8-18 and suggest the topic of your report. BOARD MEMBERSHIP- Are you interesting in a board position on the Puppeteers of Puget Sound? Do you have future aspirations to serve regionally or nationally as a board member. All roads to that journey start with serving your local guild. Please reply if your are interested in having your name placed in nomination. Here is news about what is happening in the region. Jean Mattson and Joan King of the Seattle Puppetory Theatre are selling one of their stages on Craig’s List. It was made by John and Jeanine Bartelt and is in great condition. Stage, curtain and lights included. You can see photos on the Craig’s List Post. Artists: Iggi Green, Marva Holmes, Jess Haynie-Lavelle, Elly Leaverton, Brian Kooser, Mylinda Sneed, Sarah Marie Andrews, and Jesse Elliot are creating Cake Walk! an ensemble for the parade. Would you like to be a giant puppet: Toy, Pastry, or Chef? Or possibly jump-in with some other giant toy puppet you may already have? Come to see our shenanigans in the Solstice Parade Saturday June 20th – parade starts at 3pm at 36th & Leary and winds its way East towards GasWorks Park, join us at the party there afterwards too. We look forward to seeing you! Brian Stabile is creating Boxland! 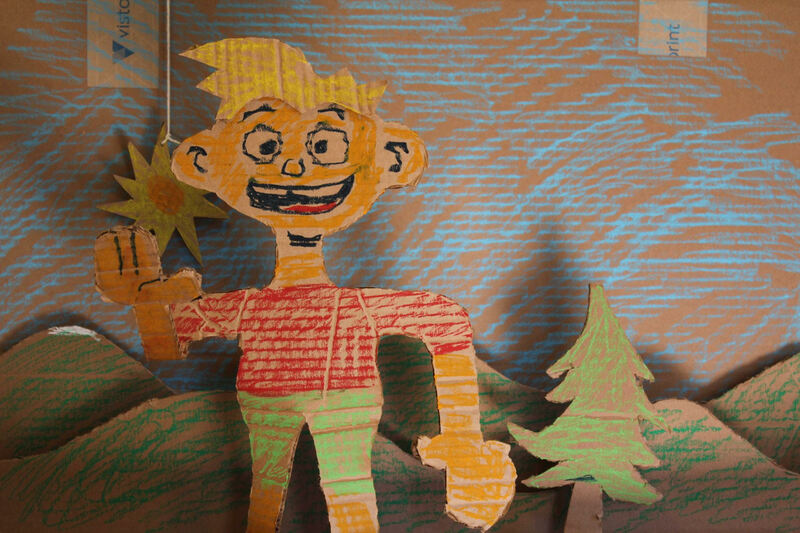 a series bout two kids who explore a world made of cardboard, made entirely with puppets! A call to puppeteers! Find out what is happening in puppetry around Puget Sound in 2014-2015, see and hear about artist Dan Cautrell’s 16’ puppet mural donated by Rob D’Arc, and see a performance of “Senor El Gato (Mr. Cat)” by Jenelle Weidlich. The event is sponsored by the Puppeteers of Puget Sound and will be held at the Thistle Theatre Studio Sept. 11, 2014 at 7:00 pm. Strawberry Theatre Workshop is seeking short puppet performances for the inaugural The Douglas Paasch Puppet Playhouse, performing at the Lee Center at Seattle University, October 3-­‐6. This is a professional opportunity to exhibit the finest contemporary work in puppetry arts, and a tribute to one of the nation’s most accomplished puppeteers, Doug Paasch. The Playhouse program will feature 4-­‐5 short puppet plays in the first act, and a longer narrative piece in act two. Strawshop is currently seeking puppet plays for the first act only—pieces that are 5-­‐20 minutes, and demonstrate the versatility and ingenuity of puppet performance. Selection will be based on quality of work, and the suitability of each project to build a cohesive first act. The Playhouse is not a new works festival, but new work will be considered. Each puppet show will receive a stipend of $300-­‐$800, depending on the breadth of the piece, numbers of artists, or transportation costs. There is no housing available. All proposals must be received prior to August 24, 2013. Early proposals are encouraged. Final program will be selected by August 31, 2013. Jim was the person who sparked a love of the puppetry for many people in this region. We regret to inform you of his passing. Friends and former students will be saddened to learn of the passing of former CWU Theatre Arts professor A. James Hawkins. Jim fought a valiant fight with cancer over the past few years but will be best remembered for his love of all children’s theatre especially his work with puppets. Funeral Mass will be celebrated at Yakima’s Holy Family Catholic Church (Tietin and 56th Ave) Tuesday July 30 at 11AM with internment at Ellensburg’s Holy Cross Cemetery at approximately 1:30PM. A small reception is planned following the internment at St. Andrew’s parish church, Ellensburg. 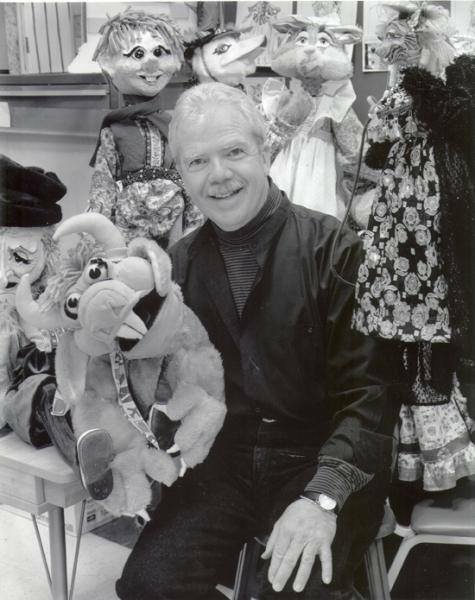 Hawkins retired from Central Washington University in 2001, having served as an award-winning professor, director, designer, master puppeteer and an advocate for children’s theatre for more than 31 years. Through his immeasurable talents, whimsical creativity, unparalleled wisdom, patience, compassion and kindness, Jim has touched literally thousands of lives over the years. He has awed the teachers, artists and puppeteers of tomorrow in the classroom, and brought the magic of live theatre countless children throughout the region. “It would be greatly appreciated if you have the opportunity to invite your members to sign his online guestbook. The family will receive a bound book of all the online guests. Guest Book for Arlin James Hawkins. There is also a memorial site. September is the month to renew your membership to the Puppeteers of Puget Sound and the Puppeteers of America. This email is a reminder notice to all officers and individuals that your tax deductable membership fee is due. Join our guild and become a member of a region rich with puppetry activities you can learn about at our website: puppeteersofpugetsound.com. If you have news to share about your latest puppet show, or have questions about Puppeteers of Puget Sound, please contact our Webmaster, Alyssa McFarland. We are lucky to have two leaders from the Puppeteers of America in our guild, Nick Hubbard and Elly Leaverton. Here is some news from them! “Hello puppeteers in the Pacific Northwest! The last few years have seen some exciting things for local puppetry. In 2010 our guild hosted the Regional Festival, Puppet-o-Rama, which was well attended and generated considerable buzz both here and nationally, including a lengthy and appreciative article from The Stranger. The Northwest Puppet Center was chosen as home for the fantastic Cook/Marks collection of 5,000 puppets. We’ve had artists doing work at venues like On the Boards, Washington Ensemble Theatre, and the Lee Center for the Arts. And thanks to fiscal sponsorship from the guild, The Fussy Cloud Puppet Slam won a grant from the Puppet Slam Network and has had a consistent run of slams. These slams have drawn diverse audiences and hosted out-of-town performers, and Fussy Cloud even collaborated with the Pacific Northwest Region of the Puppeteers of America to hold a full day of workshops that culminated in an open-mic of pieces made just hours before. If we haven’t met, then let me introduce myself as your closest link to the Puppeteers of America Board of Trustees and also one of the co-founding producers of The Fussy Cloud Puppet Slam. Please feel free to contact me with any questions about the organization or the slam. I’m excited to be starting my second term as the Pacific Northwest Regional Director, especially because it will be my first full term of two years. I was re-elected at the Regional Meeting and Puppet Slam Workshop day in Seattle. Thank you all for attending and making it a fabulous workshop event. Thank you as well to the wonderful hosts of the event: The Fussy Cloud Puppet Slam organizers. This term, I’m hoping for a Regional Festival in our region because the last one (Puppet-o-rama) brought to us by you, the Puppeteers of Puget Sound, was so great! I can’t tell you where it is yet, but you might think about renewing your passports…just in case! As the Regional Director, I’m hosting a Meetup Group for the whole region at Meetup.com: http://www.meetup.com/The-Pacific-Northwest-Puppetry-Group/. The current one is based in Seattle which is great for our guild. I can make anyone an event host, so please contact me with your info if you’d like to be a host. I plan to schedule events on Meetup for attending the shows in town, and this fall I’m going to host several workshops for hand-rod puppets (similar to Muppets). I hope you will join Meetup and come! There are also some plans in the works for a script-writing workshop. Currently, you can sign up to attend the next Puppet Slam with us. There is a discount for Guild members at this and other shows we will attend. This is an exciting time to be a part of the guild so I hope you will renew now! WHAT DOES THE GUILD MEMBERSHIP OFFER? – access to PPS scholarships (if financially qualified)Mail a check to the address listed in the membership PDF.